Revocable and blind trusts serve very different purposes. 1. How do I Set Up an Irrevocable Trust? You set up a trust to manage money, and for the legal advantages that trusts offer. 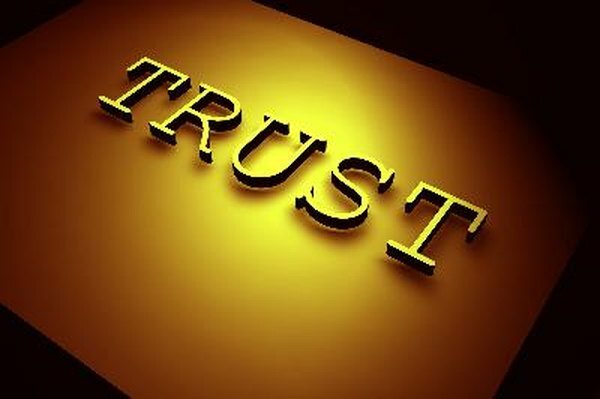 Many trusts handle estates to be passed on to beneficiaries; such a trust helps the heirs avoid probate court when the grantor dies. The trustee, a person or organization that you designate, has the responsibility of managing the assets and passing them on to beneficiaries that you name in the trust document. Blind trusts have a very different purpose, and in most cases have nothing to do with estates, inheritance or probate matters. To establish a trust, you must draw up a trust document that explains the terms, names a trustee and lists all beneficiaries of the trust. One of the most important decisions in this process revolves around a single word: revocable. A revocable trust is one that you can cancel or modify at any time. In a revocable trust, you keep ultimate control over the trust and the property placed in the trust. You do not have the power to revoke or change an irrevocable trust except under very specific, narrow circumstances. The status of the trust must be very clearly indicated in the document, and in most cases appears as part of the trust's proper name. A blind trust serves a very specific purpose: keeping the owner and the management of the trust separate. In a blind trust, the person establishing the trust -- also known as the grantor -- does not exercise any control over the assets; nor does the manager reveal any information about transactions to the grantor. Anyone with responsibility for writing law or exercising regulatory authority over public companies may need to set up a blind trust, which avoids any conflict of interest between public actions and personal finances. In a double blind trust, the grantor and manager are unaware of each other's identities. In the matter of blind trusts, elected members of the federal government -- such as the president and members of Congress -- have very strict guidelines to follow, set down by the Office of Government Ethics (OGE). An OGE-qualified blind trust may not reveal its assets either to the grantor or to the public. Any violation of this rule constitutes a criminal offense. The trust pays out income from the trust without revealing the source, and the owner must then declare that income and pay the appropriate taxes on it. A revocable trust has only one advantage for the grantor and beneficiaries: the trust does not have to go through probate court, an often time-consuming and expensive process. Instead, when the grantor dies, the trust becomes irrevocable and the trustee follows the directions in the trust concerning the assets, bequests and beneficiaries. A revocable trust has no tax advantages for the grantor: the IRS will levy estate taxes on the assets as well as taxes on interest income and capital gains. A blind trust is revocable; the grantor can cancel the trust at any time, and transfer responsibility to a different trustee. LegalAffairs.org: A Wink and a Nod: A New Scandal Exposes the Problem with Blind Trusts.